Care for UAV and third party? The cost of platforms and advanced payloads continuously increases the demand to protect the unmanned aerial vehicles and also third party. For hook equipped UAV’s we have operational hook cable systems to safely stop the vehicle at every landing. For emergency arrest and for the protection of third party we offer client specific net barriers. 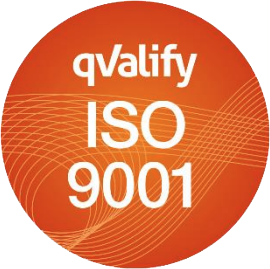 With extensive experience and computer based simulation tools we determine and present the best arresting solution based on well proven sub-systems tailored to fit the client specific operational requirements. You look for a tailored solution for your specific needs based on well proven and reliable technology? Please continue here as you are already on the best website! 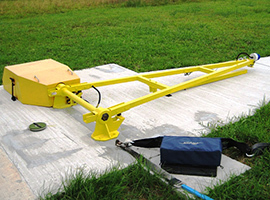 The hook cable arresting system is normally installed in both ends of the runway with a certain available run out distance. The HAS range is designed for operational use at every landing, in emergency landings and aborted takeoffs. 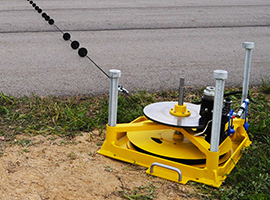 The bi-directional catching device is a cable with support discs installed across the runway. 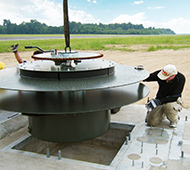 Suitable type of energy absorbers are installed, one on each side of the runway, designed with a capacity matching the weight and speed range of the UAV in operation. – UAV/BC: Disc caliper brake designed for frequent use, perfect for active operation. – UAV/WT: Rotary hydraulic brake is selected to support heavier aerial vehicles. – UAV/BT: Textile brakes for low frequency and emergency use. 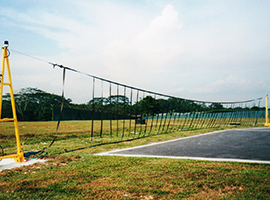 The net barrier system is installed in the overrun area and consists of two stanchions, two energy absorbers and an arresting net. 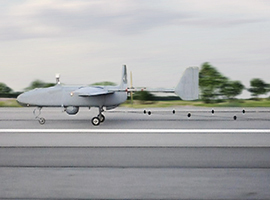 The NAS range of arresting systems is designed to support various types of UAV’s coming into emergency situation during aborted takeoff or landing. Based on received key information we present the best arresting solution including calculated performance and geometric study for the match between UAV and net. – UAV/BT: Textile brakes suitable for low frequency and emergency use. – UAV/MD: Multi-disc brake is an option to support aerial vehicles above 2 ton. – UAV/WT: Rotary hydraulic brake is selected to support the heaviest aerial vehicles.